The Earth Observation (EO) market has been in constant evolution and recently, it has transitioned from costly, large EO satellites to smaller, more nimble ones flying as part of constellations. Using many small satellites is enabling real-time earth monitoring and observation, and with this, increasingly large amounts of data are being produced every day. Additionally, medium resolution imaging (1 m. to 5 m.) is abundant, and its price relatively low and declining. This combination of price decrease and data profusion has created a business opportunity favoring the entrance of new players and the application of digital technologies into new business models, as was highlighted in NSR’s Satellite-Based Earth Observation, 9th Edition report. Small satellite constellations with new sensor technologies have enabled data and imaging of the Earth in large amounts, thereby allowing for a new set of companies to arise at the intersection of low-priced imagery and digital technologies: data analytics. 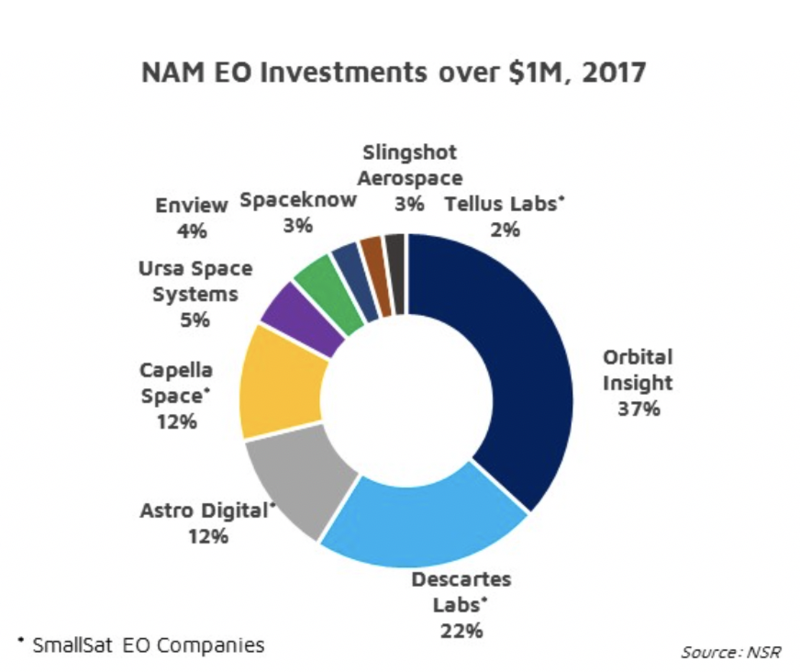 And it is not by coincidence that NSR’s research found almost 90% of new space companies dedicated to EO are for data analytics; inexpensive imagery and digital technologies can deliver high value intelligence applications at a much cheaper cost. The fact is, digitization and artificial intelligence algorithms added to new sensor types or reconfigurable payload technologies are transforming static observation data into dynamic information. 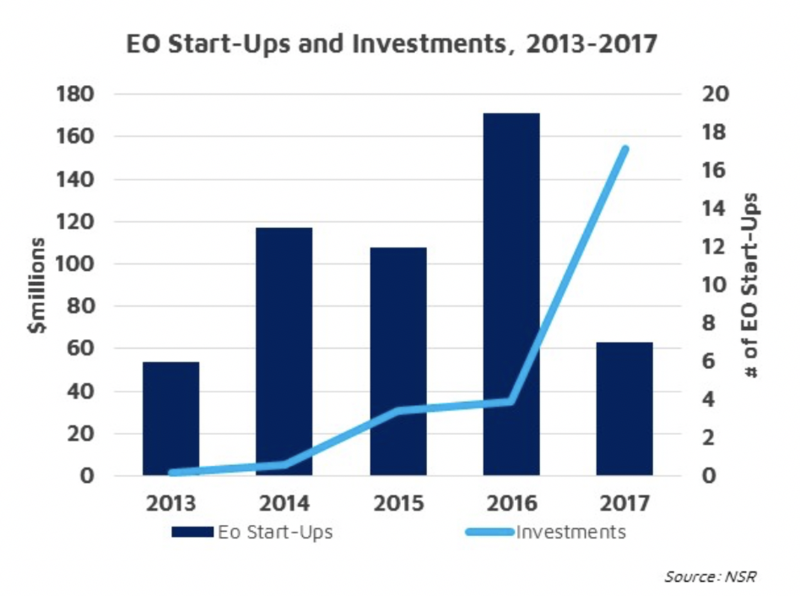 NSR tracked the evolution of investment in this segment from 2013 to 2017 and found that close to 60 EO companies were funded in this 5-year period. These are not distributed evenly across the world as 45% of new EO companies were founded in North America and captured 84% of total investments. Following in a distant second place is Western Europe with 32% of companies founded, receiving only 9% of the investment. Top Investors are in most cases U.S.-based venture capital firms, such as Balyasny Asset Management, March Capital, Bloomberg Beta, GVA Capital and Spark Capital, just to name a few. Although these and other VC firms sometimes have branches in other countries, the fact that funds are disproportionately allocated in the U.S. points to a more mature industry context for VCs than its European counterpart. Not only that, but the World Economic Forum recognized that the U.S. has fewer investment barriers for funding and growing companies, which means government-level barriers on capital markets are responsible in part for access to funding. And start-ups in Europe and other parts of the world are at a disadvantage when it comes to access to money and are not able to raise as much capital. NSR’s Emerging Space Market Opportunity report describes more in depth the geographical investment distribution in other emerging segments. Diving deeper into 2017, and more particularly into the dynamic North American market, NSR’s analysis shows most investor attention was focused on two companies: Orbital Insights and Descartes Labs. These gathered almost 60% of all investment in this segment. The large majority of funds invested (75%) went to software analytics companies that use imagery and intelligent software to understand the world like these two companies. Given the CAPEX required to build and launch satellites dedicated to Earth Observation, one would have expected that the capital raised would have gone largely into this segment, but only approx. 25% was allocated for such assets. 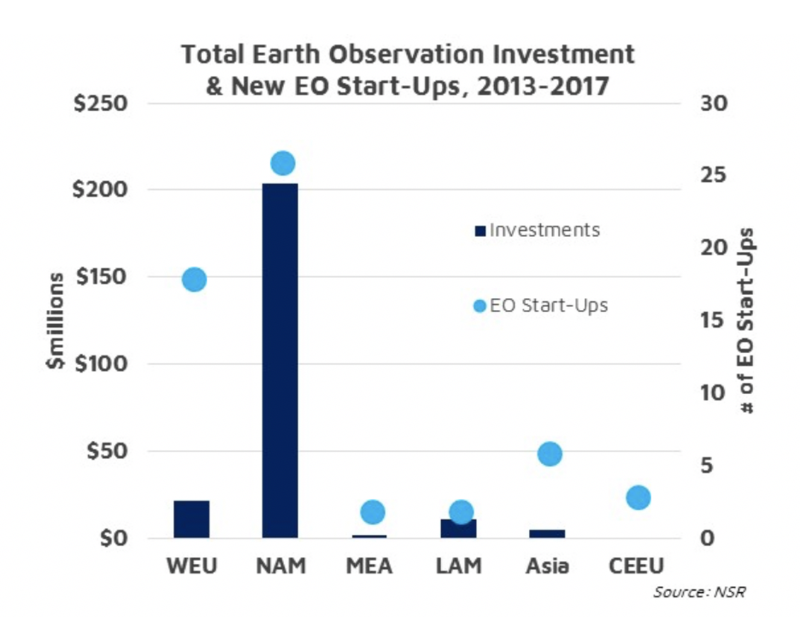 Given the large supply of EO imagery and venture capital, investors now realize the number of EO platforms has perhaps reached an upper limit. Given that imagery prices keep dropping, they also realized that money should not be invested in the data itself but in how it is interpreted and used, and that data analytics firms should receive the lion’s share of recent investments as they may very well disrupt and impact long-term the uses and performance of Earth Observation as we’ve known it. The digitization era underway now will help further quantify, describe or predict trends unforeseen today by smartly using satellite data to monitor, measure, and track multitudes of characteristics and phenomenon of our world like never seen before. This added value view to the picture of our world is probably what investors think may be worth more than a thousand words.